Other people seemed to like it, so that was very nice. 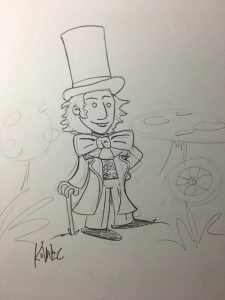 I didn’t have time to finish it off, but I now sort of want to work this up for the new Charity coloring book, and get lost in the Wonka factory background. On the other hand, folks seem to really like it as it is, and there’s been many offers to buy it, for a suitable charity donation. Which is probably what Gene Wilder would have wanted. Anyway, drawing it helping me deal with the news, that’s for sure. Rest in Peace, Mr. Wilder. Thanks for everything. I’ll be at Fan Expo Canada in Toronto for a couple of days, this weekend. The con was very nice about me leaving early, so I could spend some of the long Labor Day weekend with my girls. I’ll also try and stop by the Munchkin Tournaments on Friday and Saturday. I’m looking over the catalog now: but whoa geeze there are a lot of Big Names at this show. I might get lost in the shuffle of Industry Giants. There are only three weeks to go until Insane Charity Bike Ride 2016! THREE WEEKS! Support has been great, and pledges keep coming in. But I still don’t have to wear that duck on my head, yet. Nor the tentacles. However, you generous people are closing on 60% funding of a really great charity, bringing good food to low-income families, and the elderly! Remember – a $20 pledge gets you the new Munchkin Charity Postcard (and lots more), that officially lets you start a game at level 3! 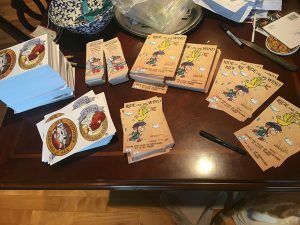 LOOK at all the postcards and swag I had to sign, last year! A $200 pledge gets you a piece of original Munchkin art (and lots more). This is the only way you can aquire a piece of original card art from the game. I don’t sell originals – I just use them for charity fundraising. There are lots of levels, and any donation at all helps – even the smallest amount gets you not one but TWO downloadable charity coloring books! Anyway long story short, you guys are awesome. Go, you guys!